Life is full of uncertainty. When you are unsure about where you will live, what job you will be working, and how you will develop as a person in the next few years, it could be challenging to plan your academic future. It's even more difficult when your spouse is serving in the military. 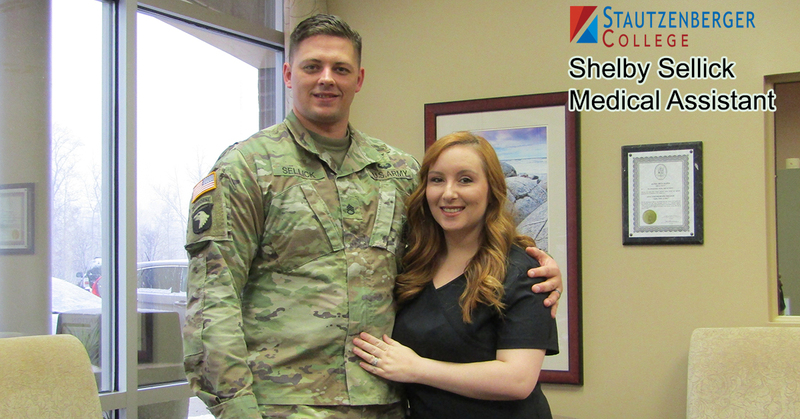 Even with a hectic, constantly-changing lifestyle, Shelby Sellick was able to earn her medical assistant diploma at Stautzenberger College. Shelby Sellick had always been intrigued by the medical field, but having a family was what encouraged her to pursue a medical career. “Having my son gave me the push to begin my career in medical assisting. I wanted the best for him,” says Mrs. Sellick. However, balancing her career dreams with her family proved to be a challenge. “When your spouse is in the military, you tend to move every two to four years, which makes it extremely difficult to enroll in college,” she says. Concerned about having to relocate while in the middle of a program, Mrs. Sellick chose our ten-month medical assisting program. She was confident she could complete her degree quickly and still have a career anywhere she moved. While at our Brecksville campus, Mrs. Sellick was inspired by Miss Ouri, her medical assisting instructor. “She was a phenomenal teacher,” she recalls. Mrs. Sellick completed her externship at St. Vincent Charity Medical Center in Solon, Ohio. Soon, she found that her hard work had paid off. She has recently been hired as a medical assistant at Internal Medicine Office Unity Health Network through Western Reserve Hospital in Cuyahoga Falls, Ohio. We hope Mrs. Sellick's story inspired you. Whether you are interested in medical assisting or one of the many other programs offered at Stautzenberger College, please come in and talk to us today to find your career passion. Call 888.859.8225 or submit our Request Information form to learn more.